Unlike when playing slots or similar games of luck, applying appropriate strategies can really make a difference while plying Blackjack. The basic dealer's advantage in blackjack is the fact that dealer wins whenever the player busts. If we use simple math, the possibility of busting is 28%, the same for the player and for the dealer. That means that in 8% of cases both of them will bust, and the dealer will win. Simple as that. 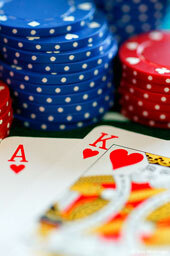 Therefore, if you apply the appropriate strategies, you can reduce the house edge, for example with cards counting. Obviously, the casino owners aren't very happy to have their profits reduced, and you will probably be thrown out from every land casino where they notice you counting cards. Maybe you cannot predict the outcome, but you can influence on the final result. Following the basic rules of playing blackjack you can seriously reduce the house edge, and improve your odds. Nevertheless, if we are talking about online casinos, the strategies are little different. There are some advantages on players' side. For example, the player can split cards, or double down, or stand on 16. The dealer isn't allowed to do that. He has to hit if his hand is 16, and he cannot split cards. Not to mention that the player gets 3:2 payout for blackjack. We were talking about the house edge. However, what is the house hold? The house hold is the actual winning for the house, or the dealer. In other words, this is the amount of actual money, the percentage of the total amount of money on the table that casino is going to keep. Of course, those terms are related to each other, the only difference is that the first is a theoretical, calculated number, and the other practical prove of the first one. Maybe not the exact one in particular example, but in a long run it should be very near.